Digital x-rays are the on the cutting edge of dental imaging. The modern sensors used in digital x-rays at Romenesko Family Dentistry use far less radiation than traditional films while still producing excellent images to diagnose issues from decay to dental abscesses. The images produced by these sensors are on the screen almost instantly. No more waiting for several minutes just to see if the correct structures on the tooth where captured. 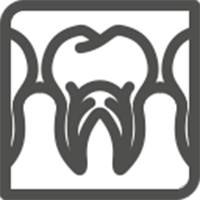 And, by being digital, the team at Romenesko Family Dentistry can view the x-rays at a larger size making diagnosing problems easier. Earlier detection can lead to better options and treatment. Finally, with digital x-rays, there are no chemicals to process the films of analog x-rays. Digital x-rays are an essential tool to keep your teeth and mouth healthy, and the team at Romenesko Family Dentistry are proud to offer them.